Kurt Weill, one of the greatest theatre showmen of his day. He wrote music of biting satire and wit, with stories of cruel, calculating women, wreaking revenge on the politics of war-torn Europe. 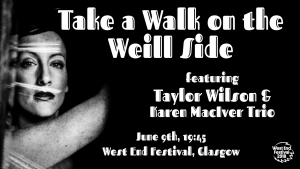 His genius endures with classics from Mack the Knife to Pirate Jenny, brought to life by celebrated chanteuse, Taylor Wilson, together with the acclaimed Karen MacIver Trio. This cabaret style performance follows the story of Jenny and how she manipulates events around the men she loves and leaves during 1940’s Nazi Germany. Think of this as a dark ‘jukebox musical’ using the fatalistic stories of the many women created in song by Kurt Weill. Well known Kurt Weill Songs that will be featured in the show include Alabama Song (covered by The Doors, David Bowie); Ballad of the Soldier’s Wife (covered by Marianne Faithfull, PJ Harvey); Mack the Knife (covered by Louis Armstrong, Robbie Williams, Michael Bublé); My Ship (covered by Ella Fitzgerald, Joanie Sommers) and September Song (covered by Frank Sinatra, Tony Bennett, Lou Reed, Bryan Ferry).